My point with looking for mirrored / symmetrical pairs with one raised eyebrow of skepticism regarding their age, is that the production method is not the common one and the distribution become very complicated. Every single step is more complicated as a matter of fact, and this is not the traditional way of doing things in China. So, I somehow sense there is a western influence involved in this, which to me points at a later date. 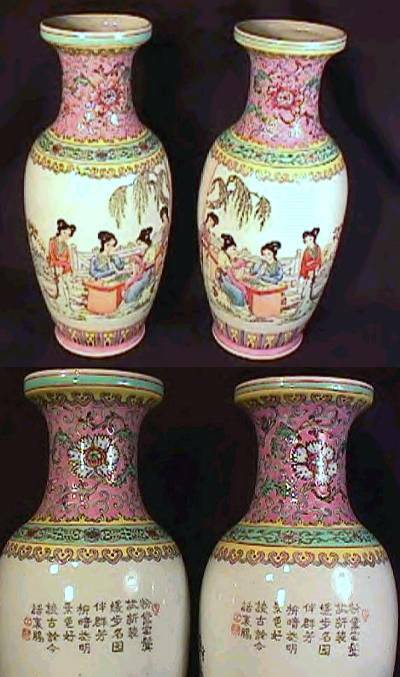 From the Chinese potters point of view he didn't make TWO pieces - he made thousands upon thousands of pieces in long rows so why make symmetrical / mirror pairs all of a sudden. The doggie vases are just "two" and "a pair" but not mirrored / symmetrical. The powder blue vases are mirrored / symmetrical though. This means that they must have been made and transported as a true pair all the way through the distribution chain - and that is complicated and expensive, especially for two so large objects. In my mind I would like to think of the powder blue vases as being from the Tongzhi 1862-74 period, which fits well with the dogs, but the mirrored decoration is still then very early as I see it. During the 18th century it seems to me from texts and archives like the decorations was drafted on one document, learnt by heart and then split up on many hands among the porcelain painters. We can see that on the long runs of Qianlong export pieces, where one pattern slowly evolves around a common "center". Sometimes so much that there might be hard to find two identical pieces to call a "pair" while it would not be a problem to see the similarities among a few dozens. To start at the other end of the time line i.e. a few years ago, I had the opportunity to see how porcelain was decorated in Jingdezhen in the 1990s. The key to the more complicated decorations was the use of thin pattern papers, with the decoration printed in pierced outlines. Then these papers were held against the unfired porcelain body and some red paint was dabbed on top of the paper so the paint left a faint pattern in red through the holes in the paper. The decoration was then painted with the help of these red dots. A mirrored decoration could then be had by just turning one of these paper patterns upside down before you dabbed on the tracing ink, and you would GET an identical but mirrored version of the decoration. If we now think that technique back in time - when did they start using papers with printed outlines as a guide for the decorators ? When were the distribution system in China good enough for making and selling pairs that MUST travel together, and when were the market so strong financially it happily would buy a pair - for decoration - instead of just one. From my point of view I can't help thinking about western influence, modern marketing and industrialization. So I think we have a window of opportunity in the late 1860s, after the Taiping rebellion and before the worldwide recession of the 1890s. Then again after 1910 and up until the 1930s when next recession sets in and the Japanese invasion changes things again. In the 1910s the market is flooded with Imperial relics and the interest in the West for Asian Art is tremendous. Around 1916 we know that some sort of Hongxien pieces of high quality are being made and from then up until the 1930s we know that great efforts are being made to satisfy the great demand there is for "antique" porcelain. So, to cut this short in my personal opinion many of the perfectly mirrored pairs we see should date to this later period. There is finally one more reason for mirrored pairs being of a late date and this is the Chinese / Daoist concept of Yin and Yang etc. I don't think the western concept of a pair is the same as that of the Chinese. 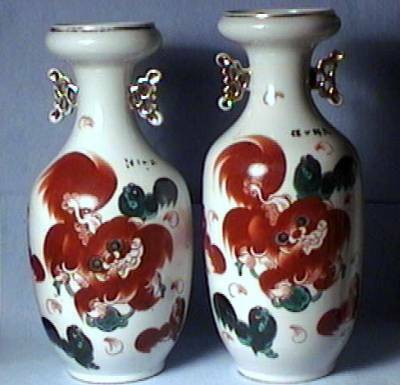 A Chinese "pair" I think should "complement" each other much rater then being a "mirror image".